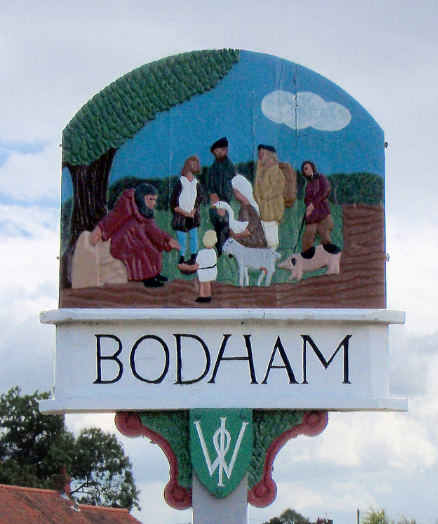 The Bodham village sign can be seen standing proud as you drive along the main road (A148) between Holt and Cromer. The unveiling took place on Sunday 16 October 2011 and a dedication followed by Rev Peter Alexander. The original sign, given by Bodham and District WI in 1977 and although refurbished in 2007, being wood it was beginning to rot. Members of the Village Bingo Club donated the new sign to the village. 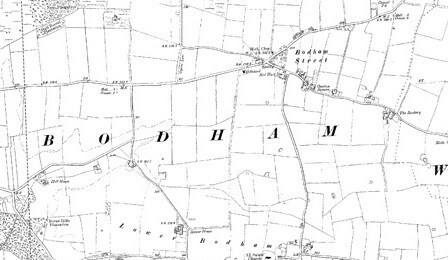 There are three mentions of Bodham as a hamlet in the Doomsday Book, and today it is a scattered village on the A148 between Holt and Cromer. It is obvious from the number of farmhouses that the main industry was agriculture. Farming still plays a prominent part but many people now work outside the village. Until 1926 there was a flourishing foundry, making agricultural and other equipment for the area. After the foundry closed the building was used as a blacksmith’s, producing tools for farming and domestic use. Now the building has been converted into private dwellings. A joinery business, started a few years ago provides some employment for local people. 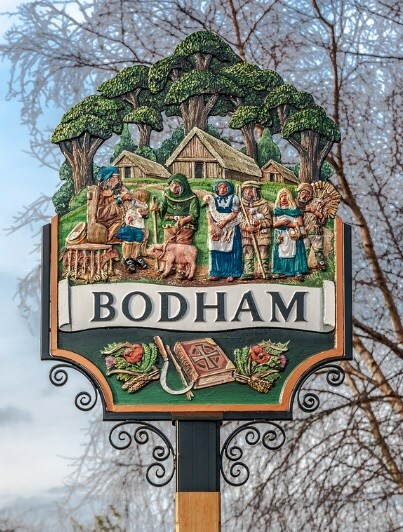 Much of Bodham and the surrounding land was owned by the Mott, later Mott-Radclyffe family, and there are still estate cottages and houses with the family’s monogram. . During recent years there have been several housing developments but latterly this has been mainly infilling. The Bodham and Beckham village Hall opened in 1986, replacing the old Jubilee Hall, which was financed by money raised in the village. There has been a local hostelry in the village since the 17oosw. One family, the Sayers were licensee for 74 years, spanning three generations. There are two churches, the Methodist Church, built in 1866, situated on the main road, and All Saints church which is some way from the village. The first rector recorded here was William De Wendling in about 1268. 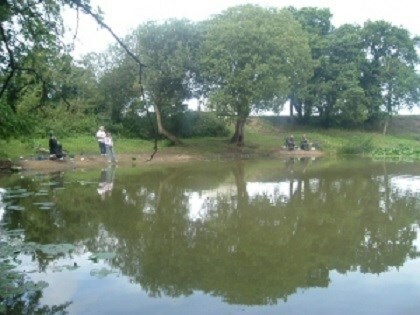 Over by the parish church, reached by Hart Lane, is the Marlpit, now a fishing pond and the Bodham Commom covers about 10 acres od unspoilt habitat. A playing field and bowling green are situated near the old School House, which is now a factory producing model “live” steam railways. You are looking for an unspecified container placed close to the Village Sign. There is no need to climb on the sign to retrieve it. There is only enough room for a log so please bring your own pen. Please replace exactly as found. Parking is available at the Village Hall, close by. Lbh'yy arrq gb srry sbe guvf bar!